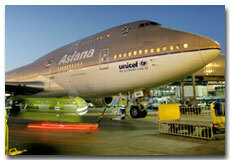 Asiana Airlines Cargo permits a vast array of products to be transported on its carriers. Cargo products are allotted according to flights, i.e., consignments are shipped as per client reservations. Asiana Airlines Cargo is an airline based in Seoul, South Korea. It was established in 1988 and its Freight services were started in 1992. The airline is the second largest in South Korea. Its international hub is located at Incheon International Airport and the domestic hub is at Gimpo International Airport. Asiana�s skilled Load Masters provide an optimized transportation environment for your individual goods through shipping simulation. New Process Control System (CSP) of Asiana Cargo carefully monitors every process of cargo transport. This system helps you verify every transport process of your valuable goods in real-time, which ranges from storage, loading, transporting and delivery. Services range from general cargo to Charter Service, Sea & Air, and AMX product package. The Asiana Airlines Cargo introduces a vast range of Unit Load Devices (ULD): Containers and Pallets. Rapid special is Cargo Transport Services that require special care of Living animals, agricultural and marine products, medical supplies, high tech products, semiconductors, exhibits, and fine arts pieces.